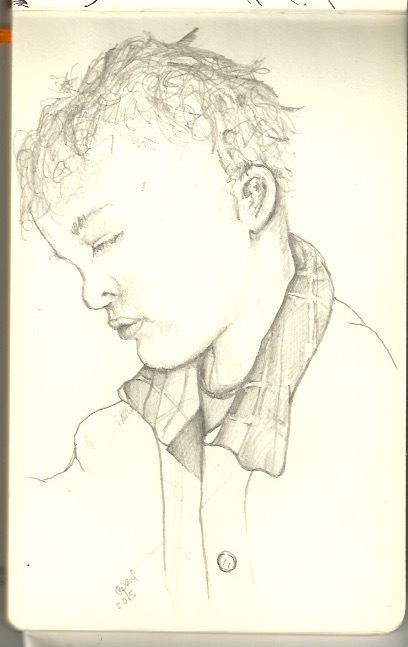 Here is a pencil portrait from a photograph of my son. It looks nothing like my son, naturally. However, I was pleased with the results for the most part. Done in my moleskin sketchbook with a basic Ticonderoga #2 pencil. For the life of me I couldn’t get the nose right. I’m just amazed that I had 20 minutes or so to work on a sketch today. My boys are particularly lazy today, maybe due to the 90+ degree weather outside. Enjoy.